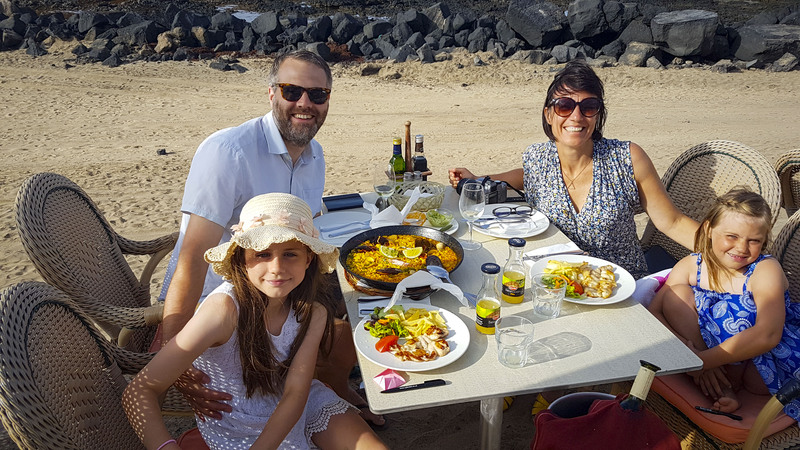 Before I tell you about our wonderful gluten-free family holiday in Lanzarote, with some tips and tricks to help you along your holiday abroad. I’d like to apologise for the lack of blog posts over the recent weeks. I was scrabbling around at the last weeks of the school term a bit like a headless chicken. We were off on our first family holiday right at the end of the school term and with the lead-up, life was really stressful. I’m sure pre-holiday stress is a big thing – so many school activities at the end of a summer term, wrapping up work and then packing and prepping for the holiday itself. No wonder why we need holidays! I was also feeling a tad anxious about our first holiday out of the UK as a gluten-free family. 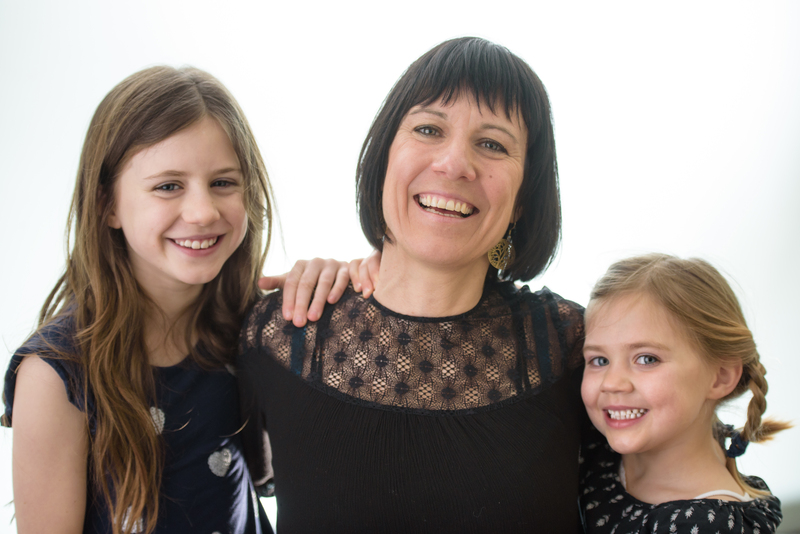 Since the girl’s diagnosis, we have quite seriously avoided much travel in the past, especially out of the UK. I know there are coeliac friendly travel companies out there but these tend to be out of our budget and actually I quite like exploring in the independent travel sort of way. 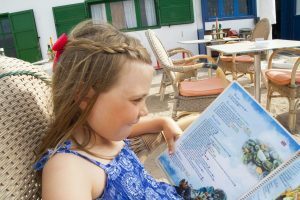 We picked our gluten-free family holiday in Lanzarote as friends had some successful holidays there and we felt a small island was an easy one to tackle for our first gluten-free overseas adventure. So playing safe, we booked an Airbnb in a fun sounding small surf town called Caleta de Famara for the first week the 2nd week a lovely rural retreat in a more luxurious villa with a swimming pool. I planned the gluten-free side of the holiday months before. We knew exactly which supermarket to go to from the airport which sold the best gluten-free products. 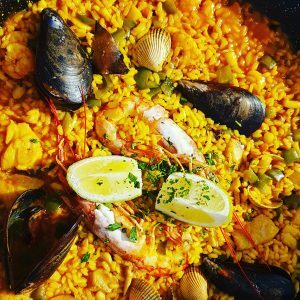 I found this out by joining the ‘Gluten-Free in Lanzarote’ Facebook group where a bunch of local and regular visitors to the island swop tips. I also downloaded a GPS only sat nav app and pre-loaded the addresses of our apartments and the supermarket, so we knew where to go and how to get there straight from getting our car hire. I got a bunch of helpful info from websites such as a local Lanzarote tourist website and other blogs, but sadly not many had been to Lanzarote. Trip Adviser is also quite good for checking gluten-free options, but I do find that it isn’t always very accurate information. Needless to say, we had a good list of restaurants in Caleta de Famara and a few other towns which hopefully would serve us well. We downloaded some international coeliac cards which we handed to the waiter or owner of restaurants. These were super helpful and I highly recommend to download the ones you need. We downloaded the Spanish one from Celiac Travels Website which is excellent. There are also others that are helpful if you have specific food allergies such as Select Wisely. We took a half a suitcase of food with us, so we had a couple of loaves of gluten-free bread, some gluten-free baguettes, some gluten-free pasta and macaroni, a good week and a half worth of the kids favourite snacks. I also took a packet of buckwheat flour, gluten-free baking powder, some doves farm gluten-free self raising flour, some crispbreads, a big bag of ground almonds for baking, some gnocchi and some golden linseeds for linseed tea to keep holiday constipation at bay & a tub of chia seeds for our super easy breakfast of chia seed porridge. We also took a silicon muffin tray (for reasons I’ll chat about to later). We also packed toaster bags – which are brilliant btw (link to buy our recommended ones are below). Not only can you use any toaster without risk of cross contamination but they are also great for making cheese toasties. Here is a list of other bits and bobs we took which were part of our essential travel kit: Our favourite tried and tested toaster bags, portable digital kitchen scales (which will be in my suitcase next time), very versatile leakproof lunch boxes, reusable water bottles that last and keep water cold all day; kids cooler lunch bags, freezer blocks to keep everything cool; packable muffin trays to make cakes on the go; digital luggage scales to make sure you’re not going over your limit and a super light suitcase to put everything in. I honestly thought I’d gone way overboard with the food but we pretty much used everything we took. I actually used the entire packet of buckwheat flour as I made pancakes and biscuits out of these when we ran out of gluten-free bread and snacks. The buckwheat pancakes went down a right treat with fresh lemons off the tree and honey. We shopped in the big supermarket near the airport where we found lots of gluten-free products as our sources of information had told us. We bought enough for a couple of days – mainly just bread, cereal, almond milks and some snacks. Arriving in Caleta de Famara, we were struck by the beautiful cliffs surrounding the beaches, the rugged coastline and the small but cool vibe of the place. It was a dusky village full of sand and dust tracks. Needless to say, the local supermarkets were tiny. To our surprise, they had a small gluten-free section with Schar brioche, some lovely crisp toasts and some biscuits but sadly no bread. We also found some nice fresh Spanish goats cheese, cured meats and some big juicy tomatoes. There wasn’t much variety of vegetables or any fresh fish or meat The lack of fish really surprised me especially as Famara was an old fishing village. There didn’t seem to be anywhere to buy fresh local fish. We had some at the local restaurant which was fantastic, but to buy some we had to drive back to the capital, so we did just that a couple of days later. It seems that people catch their own fish, there were locals with fishing rods most days and we also spotted the waiters of the fish restaurant collecting the mussels off the rocks every morning. We also spotted a father and son snorkelling and emerging from the water with an octopus and headed for the restaurants. That evening I had paella which had a lot of octopus in, and it tasted very fresh, utterly delicious actually !! Another thing we weren’t prepared for, ( I know this is an unusual one) is we needed an oven and kitchen scales to make my daughters cakes for her egg desensitisation program. Our first apartment had a very small kitchen with a portable induction 2 ring hob, but no grill or oven. We were a little prepared in that we had some cakes left over from the previous weeks batch. Unfortunately (just as luck would have it) our freezer had broken just before we left home so these weren’t as fresh as we liked. She did end up having these cakes even though they were rather old and on the stale side. As we cook a lot, it was difficult to cook in such a tiny kitchen but we managed. The apartment had an incredible view, which made prepping food and making lunches a great experience. I managed to pan fry the fish one time with huge success. We also managed to make sushi and cooked pasta with a vegetable tomato sauce. 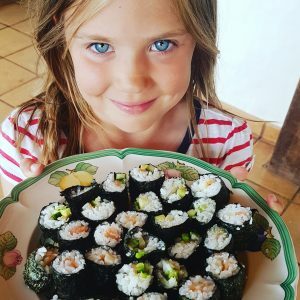 We found the sushi rice, nori seaweed and gluten-free soya sauce in the big supermarket to our delight as the kids love sushi and it makes a welcome break to sandwiches for a packed lunch. They fit perfectly in the lunch boxes we brought with us and was easy to put the soya sauce in to dip. The supermarket we were recommended to go to for a gluten-free family holiday was Mercadona chain and we found a huge one in Arrecife. We found so many ‘sin gluten’ products dotted around the large hypermarket. This included some bread which was not Schar wholemeal bread but tasted just the same. We also found some very tasty crackers, cereals, pasta. Many crisps, chocolate and snacks that were safe to eat were generally labelled ‘sin gluten’, so much better labelled than in the UK. Once we sussed out to not to underestimate how much gluten-free bread and snacks we needed, we were ok with stocking up at the supermarket. It also meant that I could go and stock up on the delicious fresh fish that was on the food counter. In our second week, we stayed up north of the island in a rural retreat which was beautiful and very relaxing. The kids had a swimming pool to play in every day and they found some friends the same age to hang out with. This made for an even more relaxing break for us. We found a lovely Municipal market in this second week that had a fish, meat and vegetable stall for the locals. I was so excited to see this as it meant I didn’t have to drive 30 mins to the capital to buy fresh fish from the big supermarket. We bought ‘Breca’ which is Bray in English and ‘Lubina’ which is Seabass. However, we had another food disaster that night where we tried to light the BBQ. The coal we brought just didn’t burn properly, as it got late we decided to bake the fish in the oven. Then the fish fell apart in the oven and the flavours weren’t fresh. The kids refused to eat it and I was pleased we didn’t BBQ it as it would’ve fallen through. I think the fish was either not fresh at all or had been frozen which is why it went mushy. We ended up eating some toast with the veg! We only really ate out in Caleta de Famara and on our last day on the other side of the island as the second week in the rural villas we had the most amazing kitchen and it was quite remote. We were all happy enough to stay in the area rather than get in the car and find somewhere to eat. We got into the nack of stocking up on food at this point too. In Famara, there are a few cafes and restaurants and the main 3 have terraces overlooking the beach and sea. All these are fish restaurants and recommended as places we could eat safely. 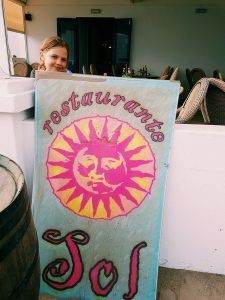 The first restaurant we tried – Restaurant Sol, is actually on the beach and the kids really loved it and wanted to go back here again and again. We didn’t complain as we liked it too and there’s something really lovely about sitting on the beautiful terrace looking out to sea with the cliffs around you. I must admit I was quite nervous about the first time we ate out. I was worried the staff would not understand cross contamination and that I wouldn’t be able to communicate the issues. 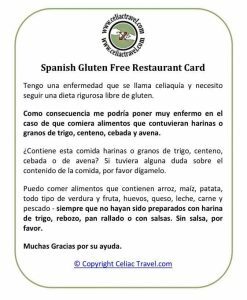 I popped into the restaurant for the first time on my own and showed the owner the coeliac card in Spanish. It was great, as soon as he read it he put me at ease. He showed me the special menu with all the allergens for each dish on and said it’s no problem. I felt such a huge relief and actually a bit emotional that we could eat out safely. I couldn’t help worrying though as is probably natural for a mother ( or is it just me?). The kids were so excited about eating out, they got dressed up for each occasion and were ready to go. 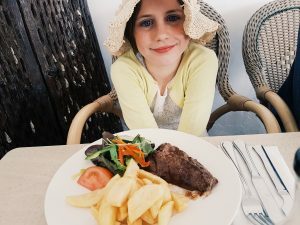 There was some good choice for the kids, mainly grilled fish and chips, but they decided to have venison and chips which was on the children’s menu. The waiter assured me that the chips were cooked in a separate fryer than anything else. I thought my concerns were lost in translation, but the next day the kids were fine with no tummy aches more than they usually have. My husband and I shared a fish platter which we shared with the girls as that was gluten free too. 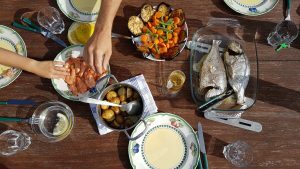 It was perfectly fresh and tasty and presented with salad and Lanzarote potatoes. We had a great meal out, it was lots of fun and the kids were so happy. For dessert, our eldest spotted a Vienetta which we know is gluten-free. They were delighted. The other times we ate out was much the same, the kids only really choosing grilled fish other than the venison the first time, but we were all happy with that. The paella was also gluten-free as were a plate of octopus and prawns. Our youngest loved the paella and always wanted me to order it so she could share it with me. 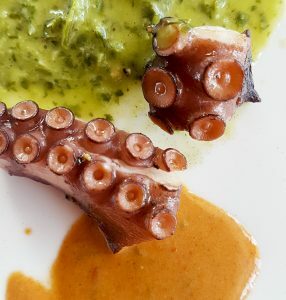 She also loved trying the seafood – especially prawns and octopus which were in abundance in Lanzarote. I would have like to have tried a tapas bar, but when I looked on the menu, so much contained gluten that I felt it would be too much of a risk. There was only really a plate of prawns or sardines as an option for them. There was a tortilla but as our eldest also has a severe egg allergy that was out of the question. When we were out and about for lunch, we filled up our lunchboxes with salads, fruit, cheeses and meats, and a few times with sushi. We had plenty of drinks and ice creams out though as we do also in the UK. This always makes up for the lack of being able to eat out anywhere we like and it means we still get to sit around chatting or playing games as a family in different bars or cafes. Eating in was actually a highlight for me. We enjoyed some amazing lunches with the local cheeses and meats and our gluten free bread. The serrano ham from the deli counter in the large supermarket was some of the best I have ever tasted and the kids couldn’t get enough of the dried cured sausages. 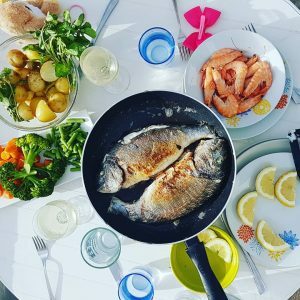 For evening dinners in, we had dishes like chorizo and tomato sauce with gluten-free pasta or rice, or a feast of fresh fish, seafood and vegetables when I could get hold of some. I did make them cauliflower and macaroni cheese one evening with Spanish cheese which worked well, and they just loved that. 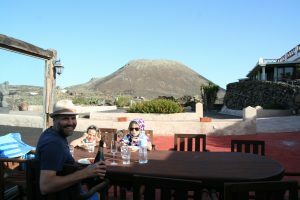 We had an amazing gluten-free family holiday in Lanzarote and we managed to relax and switch off which we needed to do. Lanzarote is a great place for a family holiday with a great mix of stuff to do (I never even mentioned the inspiring Cesar Manrique museum, caves and foundation). There are lots of beaches to choose from whether you want a safe swim in a lagoon, sand castle fun with various colours of sand or surfing and body boarding. We went in the windy season (May to end August), and the North of the island gathers a lot of clouds which we didn’t realise. But it was still very warm and a bit of a welcome break from the heat in the UK this year. We managed quite a few stunning treks with and without the kids which was made easier by the cooler climate in the North. Having the swimming pool was a treat, and we all thoroughly enjoyed our time mucking about and cooling off in the water. In terms of eating out, I managed to face some fears and so did the kids. We all feel more confident about going abroad and eating different foods with such complicated dietary complications and are really excited about going abroad again and trying some new places. 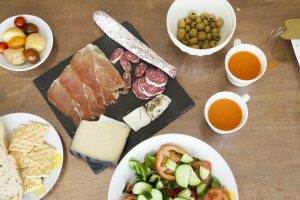 I would say that self-catering is an absolute must and the bigger and better the kitchen then the better your experience of cooking with local food. In Europe, the 14 allergens are so much more clearly labelled in both supermarkets and many restaurants than you find in the UK. This made life much easier for us. There is the question of cross-contamination and the understanding of this within restaurants, but the allergy and coeliac cards helped us communicate with the business owners fine. The hours of research I did beforehand definitely paid off for places to eat out and where to shop. Though we were actually really happy to do a big shop and then cook at the villa with as much fresh local produce as we could find. This is certainly the safe option (and much cheaper if you are on a budget), and it meant we could try some of the local delights in a safe environment. I think we ate really well and healthily too, the kids got to try a lot of different foods, practised their Spanish and really relished in eating out when we did. The only thing I was disappointed about was the lack of local fresh fish in such a small island surrounded by sea. I’m not sure if we were just unlucky, but the only places we found good fish was in the restaurants and the Arrecife supermarkets. There was also a lack of fresh fruit and vegetables which I’m not hugely surprised about as the island lacks so much water so fresh vegetables are quite difficult to grow. I’d love to hear about your gluten-free family holiday abroad, where you found the best and the most challenging place to go and any tips and tricks that you’d like to share. Please comment below and please don’t forget to subscribe to my blog. Some e-books and treats are coming soon to my readers so look out! You can change your mind at any time by clicking the unsubscribe link in the footer of any email you receive from us, or by contacting us at eggainstthegrain@gmail.com. We will treat your information with respect. For more information about our privacy practices please visit our website. By clicking below, you agree that we may process your information in accordance with these terms. Thanks for the shout out for Lanzarote Information. This is a great article, and we’ll share it via social for our readers. Thanks so much for sharing. We had a great time in Lanzarote, would love to go back. And thank you also for your really helpful info on your website. Thank you Jo, thanks for the amazing recommendations for places to stay.